Puget Sound’s shifting climate may mean big changes for the region’s farmers, according to a new report commissioned by the Puget Sound Institute. New patterns of droughts and floods, along with changes in the growing season will influence the way crops are grown — and even the types of crops that thrive in the region. Christopher Dunagan brings us part two of our series on the report’s findings. Farmers in the Puget Sound region will face the uneven push and pull of climate change over the next 50 to 80 years, according to leading Northwest climatologists. Economically, the impacts may be mixed. Increased levels of carbon dioxide will generally boost plant growth, while warmer temperatures will extend the growing season. Both factors are expected to increase crop yields —provided there is enough water for irrigation. But this question of water availability is no small matter. A shortage in any given year could wipe out gains that a farmer could hope to see. The uncertainties of water, a rising number of floods and the potential onslaught of dangerous pests could keep our future farmers awake at night. Challenges facing the agricultural sector in the Puget Sound region are among the issues presented in a new report that pulls together the best information known about climate change. Other concerns not specifically related to farms include increasing landslides, declining salmon runs and greater health problems among the human population. The report, called “State of Knowledge: Climate Change in Puget Sound,” was produced by the Climate Impacts Group at the University of Washington. It was commissioned by the Puget Sound Institute with funding from the Environmental Protection Agency, along with contributions from the National Oceanic and Atmospheric Administration and appropriations from the state legislature. “It is designed to be an easy-to-read summary that complements the foundational literature from which it draws,” states the report, written by 10 regional scientists with the help of 34 contributors. How agriculture adapts to climate change may become one of the few success stories in a changing world where natural ecosystems — many of them stable for thousands of years — are disrupted by rising temperatures, shifts in precipitation and increasing acidification of marine waters. Puget Sound farmers currently produce about 70 crops, not counting direct-to-market crops typically sold by small farms, she said. An examination of climate models suggests that supplies of freshwater will be a major challenge for farmers and ranchers in the years to come. Declining winter snowpack — which results as more precipitation falls as rain rather than snow — could mean less water for summer irrigation. Efforts to save salmon runs could reduce the available water supply even further. Total summer runoff for Puget Sound is projected to decrease between 32 and 40 percent by the 2080s. 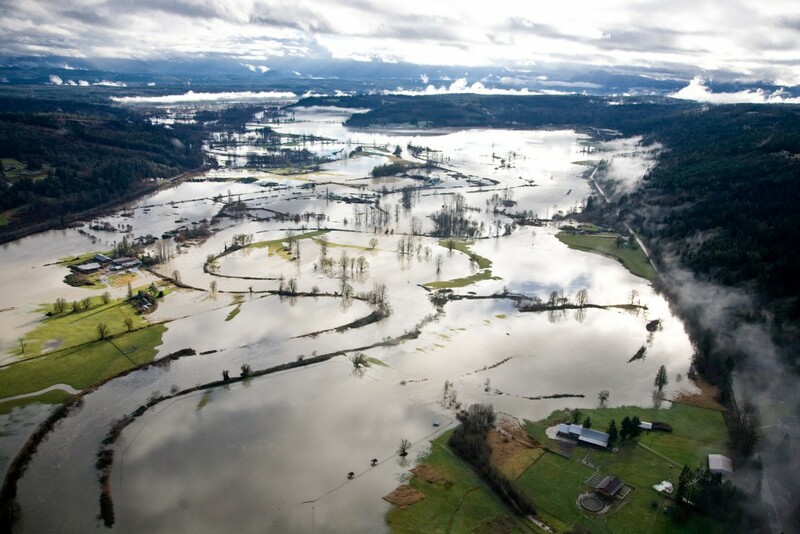 During the winter, farms located near marine shorelines and in river valleys could be forced to contend with larger and more frequent floods. That’s because peak winter flows are expected to increase between 18 and 55 percent for the 12 Puget Sound watersheds by the 2080s. Those flows are driven in part by changes in rainfall leading to more downpours. The heaviest 24-hour storm events are expected to increase 19 percent, on average, by the 2080s. Changes in flood management may not make a significant difference, according to the report. In the Skagit River, for example, the 100-year flood volume is expected to increase by 49 percent under current management practices. Simulations suggest that even with significant changes in the operation of flood-control dams and other efforts, the 100-year flood volume will still increase by 42 percent. Even today, high tides tend to slow the flow of water draining from farmland. Rising sea levels will exacerbate the problem. In the Skagit River floodplain, the area flooded in a 100-year storm is projected to increase by 74 percent by 2080. Rising sea levels also could directly inundate existing farmland, taking it out of production. 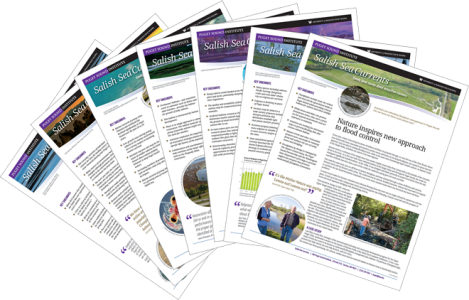 On the Swinomish Reservation in Skagit County, sea level rise could inundate more than 1,100 acres of reservation land — including the only agricultural lands on the reservation. Tulip bulbs and vegetable crops are especially vulnerable to flooding, which could force farmers in Skagit County to change the crops they wish to plant. According to McLain, farmers will be challenged to adapt to climate changes, just as they continually react to changes in weather from year to year. Floodwaters can increase soil moisture, which can benefit crops, she noted, as long as the standing water clears out in time for planting. A good example, she said, was the drought of last summer, when dry conditions stressed many crops, leading to increased pest problems. Farmers responded by increasing the number of pesticide applications. In the future, warmer temperatures brought by climate change are likely to increase the survival of some pests that already plague farmers, and the warmer climate could increase the range of pests that normally stay in areas to the south. The recent drought in the Puget Sound region caused crops to mature earlier — generally from one to four weeks earlier, McLain said. If that becomes the future norm, farmers would adjust. If the problems can be limited, the overall balance may be in favor of the farmer. A warmer climate could allow for the growing of grapes in the Puget Sound lowlands by the year 2050, while other crops would benefit from longer growing seasons and increased growth from carbon dioxide, according to the report. One drawback of higher CO2 levels is a reduction in nutritional value of forage and pasture for livestock, although this problem can be largely overcome with an increased application of nitrogen fertilizers. Unlike many natural systems, farmers may be able to adapt quickly to the changes in climate, helping to counterbalance what would otherwise be a disaster. Changes to new crops and new farm-management systems could be expensive, but they can be done. In today’s world, farmers often rely on annual weather predictions, which are based on observations of El Niño and other long-term trends. Western Washington farms are less vulnerable to climate change than those in Eastern Washington, the report says. Greater water availability, access to urban markets and milder overall climate — thanks to the proximity to the coast — will make it easier for Puget Sound farmers to adjust.